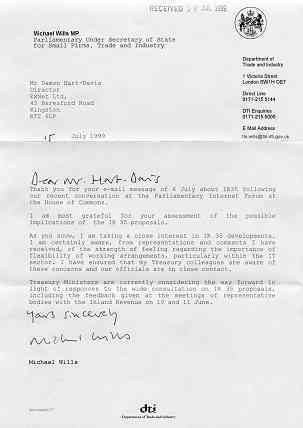 This page concerns correspondence until 1st August 1999 with MPs and government ministers in an attempt to deflect IR35. 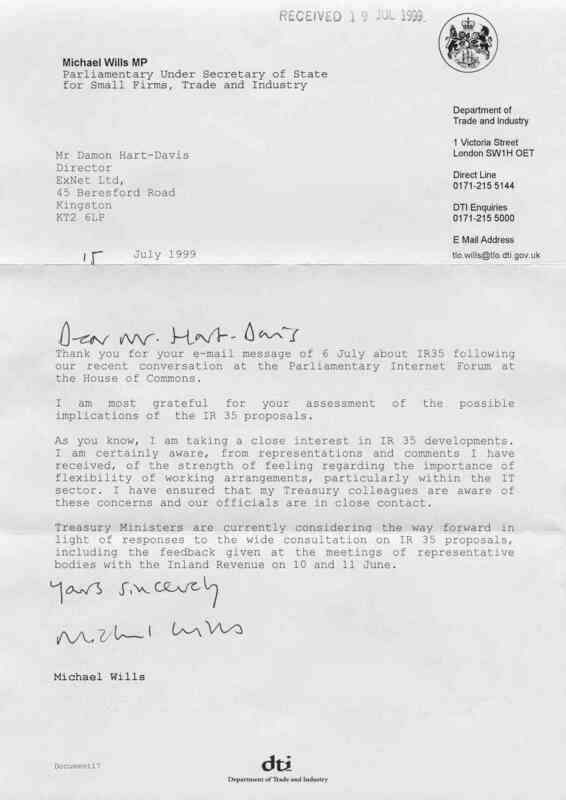 Read the letter I sent to Michael Wills MP, the then Parliamentary Under Secretary of State for Small Firms Trade and Industry on 6th July 1999. I sent more-or-less the same summary of my views on IR35 and its dangers to my MP Dr Jenny Tonge, and to Derek Wyatt MP. Thanks for your e-mail. I fully agree with your concerns, namely that the proposals would reduce your rights and opportunities. For although the proposals may seek to curtail tax avoidance, I fear the argument has been lost as a result of the issues which you and may others have raised on this matter. On 17 May the Liberal Democrat Treasury Spokesperson (and MP for Twickenham!) Vincent Cable spoke on this very issue in the House. You could find his speech in Hansard via the Parliament pages on the web, but let me know if you would like a copy. My Liberal Democrat colleagues and I believe that there is a great need for freelance-based project work in the modern British economy. We do not believe that the formation of such companies is for tax avoidance purpose, but rather we recognise that the very nature of your particular expertise requires a more flexible workforce; consequently, we oppose any recommendations that might limit such opportunities. I am also of the opinion that forcing freelancers into becoming employees will result in them being little more than temporary workers. This will make them eligible for benefits, thereby minimising any gain the Government might otherwise have obtained. Furthermore, I fear the measures, if pushed through, might stifle entrepreneurship at home, thereby forcing freelance workers to base themselves abroad. I do hope these comments serve to reassure you that we will continue in our opposition to these measures. Thank you very much for your email of July 6th 1999. 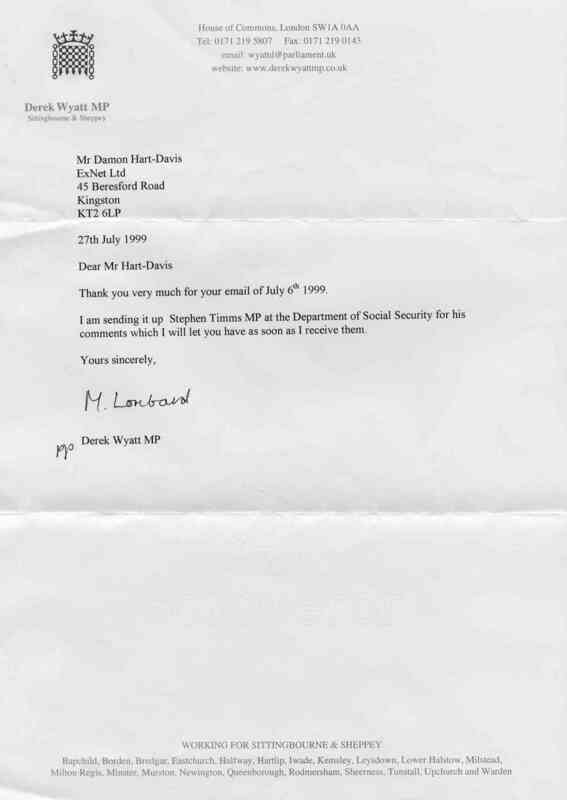 I am sending it up [to] Stephen Timms MP at the Department of Social Security for his comments, which I will let you have as soon as I receive them. Thank you for your e-mail message of 6 July about IR35 following our recent conversation at the Parliamentary Internet Forum at the House of Commons. I am most grateful for your assessment of the possible implications of the IR 35 proposals. As you know, I am taking a close interest in IR 35 developments. I am certainly aware, from representations and comments I have received, of the strength of feeling regarding the importance of flexibility of working arrangements, particularly within the IT sector. I have ensured that my Treasury colleagues are aware of these concerns and our officials are in close contact. Treasury Ministers are currently considering the way forward in light of responses to the wide consultation on IR 35 proposals, including the feedback given at the meetings of representative bodies with the Inland Revenue on 10 and 11 June. Obviously, it is important to keep the pressure up, else the Government is going to end up killing two of its favourite areas of business, IT and the City. 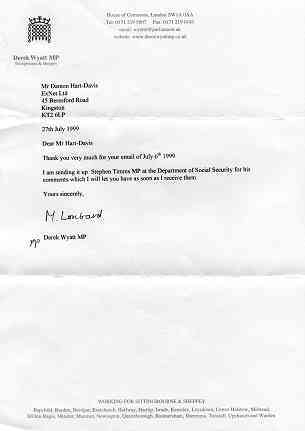 Next: Correspondence up to 1st October 1999.